Naissance Vitamin E Oil (no. 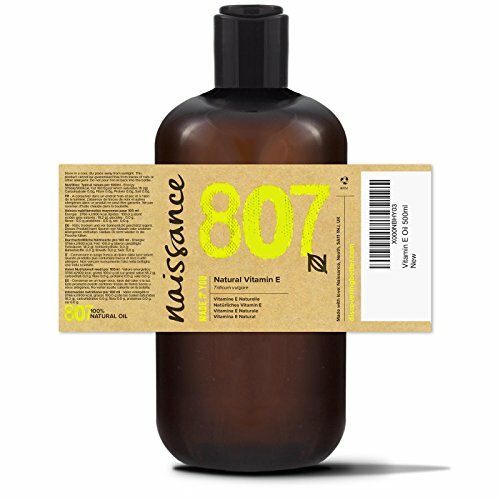 807) 1 Litre (2 x 500ml) – Natural, Vegan, Cruelty Free, Hexane Free, No GMO – Moisturising & Rejuvenating – Ideal for Aromatherapy, Skincare, Haircare, Nailcare and DIY Beauty Recipes. Natural Vitamin E is a wonderful addition to skin and hair care products like creams, cleansers, shampoo and balms. It can help prolong the life of your homemade cosmetics because of its antioxidant properties, with the added benefits of extra moisturisation powers. Vitamin E is an all-round useful oil to use in your beauty regime. Our naturally derived Vitamin E contains 0.25% Tocopherol. We are currently looking at supplying a pure mixed Tocopherol as an antioxidant for your homemade beauty formulations, so keep your eyes peeled for an update! 100% natural Vitamin E (d-alpha-Tocopherol) is a plant-based form of vitamin E that is better and easier for your body to absorb compared to synthetic vitamin E.
A natural antioxidant that can help you naturally protect the skin from free radical damage. Particularly good for those with dry skin, Vitamin E helps rejuvenate, revitalise and moisturise skin. Helps strengthen, restore and nourish hair.